The Chennai Study Group re-assembled after a two month summer break, and members looked refreshed after family vacations and travels! We started off with a whole bunch of announcements by our Chairperson sensei Malathi who updated us on Iemoto Akane's impending visit to Delhi and the Taiwan Regional conference. There were congratulations all around for our two new teachers - Prerana and Trishala - who received their certificates amidst cheers. Fourteen of us gathered for the demonstration by sensei Meenu who worked with "Unusual Containers" as her theme. 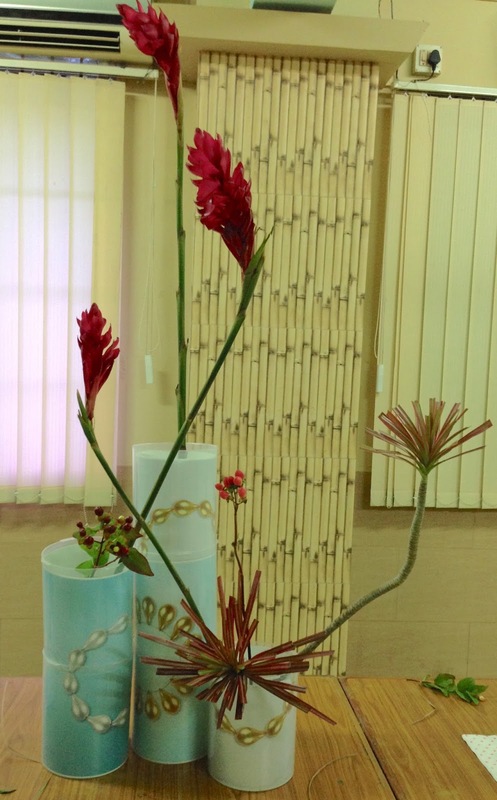 For her first arrangement, she used a moribana container, reversed as a base, and created a structure with wires. Using anthuriums, gypsophila and berries, she created a lovely light composition. For her second composition, she began with two painted stools. She upturned the larger one, and placed in it a hand beater with a bright blue fabric as a focal point. With the other smaller stool, she placed it so that we could see the painted horse, and arranged carnations behind. The two halves were unified with the circular arrangement of levels and grasses on both sides. The unusual and bright second arrangement, demonstrated by sensei Meenu. Notice the lovely painted horse. It was now time for the workshop, and we had a wonderful set of unusual containers and creative expressions. Sensei Malathi used calendar paper as a vase, as well as a main line, beautifully set off by the yellow jerbera and the anthurium leaves. Sensei Molly was innovative with her use of a dry hydrangea as a focus. She spoke of how it reminded her of the scorching summer and the green represented the first rains and the coming of new life. Sensei Prerana showed the influence of her passion for painting with this "still life"-like composition, using the grill from her refrigerator as a base! The dramatic seed pods gave a windswept look, while the pomegranate brought balance. Janaki found a new use for her shoe box! She complemented the design on the box beautifully, echoing the red and white in her composition. We have a new member - Chitra (whom we shall refer to as Chitra Jr for the sake of differentiation! This was her composition in a box, and a very creative all-leaf expression. Sensei Ambika picked up six CD plastic canisters from her workplace. She then used discarded jewellery posters to develop a design and create her rather unusual set of containers. Bold lines with Ginger lilies and variegated dressina brought colour and drama to her composition. Chitra Thiagarajan was artistic and creative in her use of this bright blue ladies handbag, and the coral "fan" with the white carnations, gave one a distinct reminder of a visit to the powder room, a coffee morning and the laughter of ladies! Sensei Trishala created this on the spur of the moment, using material leftover from everyone else's arrangements, and the red carnation worked as beautiful focus from the green of the palm. The eucalyptus softened the harshness of the steel kitchen container. And we also had a shoe! Bhuvana created this composition that reminded one of Cinderella's lost slipper, showing that Ikebana creations are limitless, if we let our imagination rule. Pushkala used an old emergency lantern, with the jerberas symbolic of the light that should come from them! An ostrich egg! This was Pushkala's other unusual container! An old wooden rice measuring "cup" was used by Chelvi. See how the handle of the jar is balanced and complemented by the umbrella plant forms. All in all it was a morning of creative effort, topped by some lovely lasagne by Zaitoon. Sensei Molly will be demonstrating in August. And the date will be conveyed shortly.